As timing would have had it, I gave birth to a baby at around the same time my husband created a baby of his own – his startup. It’s meant doing a lot of things alone; from pediatrician visits, to playdates, to grocery runs, with everything in between. There’s no way I could have done any of this without babywearing. It was only after a few days that some random Googling led me to a forum on ergonomic carriers. Now, I’d been told my carrier was ergonomic, because it was two-shouldered and supported my back. I hadn’t bothered to research it any further, because there’s quite enough to learn about when you have a new baby as it is. I’d gone one step further and asked my doctor about the safety of carriers too, and, again, she’d just told me to find an ‘ergonomic’ one. Unfortunately, it turns out there’s a lot more to ergonomics than just supporting the parent ergonomically. The baby carrier has to support the baby too. What does this mean? Most obviously – the baby’s knees need to form an M-shape with its bum centrally positioned for its hips to be perfectly spread open and supported in their natural position. Most carriers in stores in India will have the baby’s legs going straight down. While this is the way that adults’ legs fall, it’s not natural for a baby. Observe your baby in their natural state – their legs will be spread out. When carriers ‘dangle’ the legs straight down, it places pressure on the baby’s crotch and hip joints. This pressure is increased manifold along both the hips as well as the lower spine if the baby’s facing outward. An ergonomic carrier will support the baby’s hips well, and invariably discourage outward facing positions. I know – celebs wear their babies facing the paparazzi all the time. Well, they really shouldn’t, unless they have one of the very few ergonomic carriers which are safe to wear in this position (eg: Ergo 360). Armed with this information, I went shopping again. I was in luck; at the time my daughter was born, a few Indian mompreneurs were just entering the babywearing market with homegrown products. It’s important to note all of these had been stringently tested by international standards before being marketed – another thing to make sure of before you buy a baby carrier. FYI – the name-brand store I’d bought mine from had not been tested internationally either. Phew, there’s a lot I learned from buying that one! 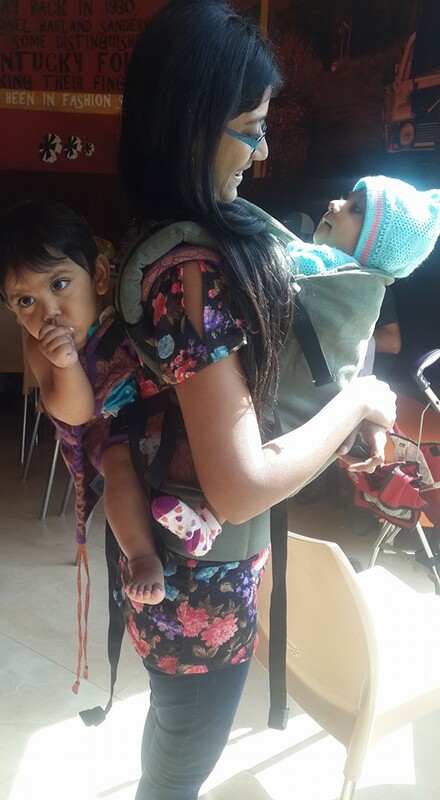 I joined babywearing forums (Babywearing India and Wrap Your Baby – Babywearing in India are the two most active Facebook groups for Indian parents) and discovered a wealth of wisdom, as well as contacts to Indian vendors. I learned I could have been babywearing from day 1, and, in fact, preemies and lower birth weight babies do very well when worn. I bought a ring sling when my baby was a month old, and, believe me, it made such a huge difference. She cried less. She slept more. I got out of the house every single day. As she’s grown from 2kgs, to 4kgs, to 6kgs, and is now nearing 10kgs, I’ve carried her just as comfortably, and for just as long, with both my hands free to continue doing whatever else I needed to do. But apart from the convenience factor for me, babywearing is also what comforts my daughter. In a crowd, when she’s teething, or just because I’ve been gone for a while, I put her in a carrier, and she’s instantly soothed. Statistics say babyworn infants cry less. I can attest this is true. I’m happy that there are carriers which can ensure I wear her close to me until she’s 3 or 4 years old. Neither of us is ready to give up that bond any time soon! If and when I have another baby, I hope to babywear from day one! Meanwhile, I talk about babywearing and ergonomics to anyone whom I see, in the hope that they see the difference it can make.